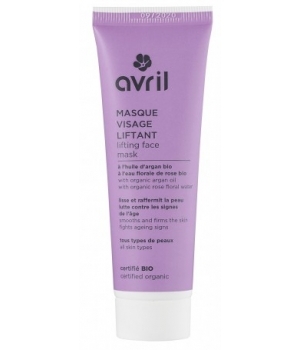 This Avril Lifting Facial Mask 50ml has anti-ageing properties. Enriched with organic Shea Butter and Rose flower water known for their moisturising and firming qualities, this mask regenerates and thoroughly nourishes your skin. Contains white Clay that soflty eliminates impurities. Contains protective and nourishing Shea Butter. Contains soothing and revitalising organic Damask Rose water. Contains Jania Rubens Algae that fosters Collagen production. 99% of total ingredients are from natural origin. 20% of total ingredients are from the Organic Farming. Apply once or twice a week on wet skin avoiding contact with your eyes. Leave for 10 minutes and rinse with clear water.